How much does a neutrino weigh? 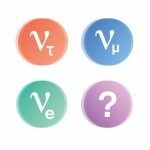 Which neutrino is the lightest? How many flavors of neutrinos are there? Are neutrinos their own antiparticles? Do neutrinos violate the symmetries of physics? Where do the most energetic neutrinos come from? Neutrino flavors: electron (νe), muon (νμ), and tau (ντ). Antineutrinos: neutrinos made of antimatter. Sterile neutrinos: a hypothesized fourth kind of neutrino. Neutrino masses: mass 1, 2, and 3, also referred to as ν1, ν2, and ν3. Neutrino energies: low, medium, or high. All Things Neutrino was developed by Fermi National Accelerator Laboratory, America’s premier laboratory for particle physics and accelerator research. Fermilab is the host lab for the international Deep Underground Neutrino Experiment, DUNE. We hope this site will serve as a resource for all those intrigued by the mysterious neutrinos that are traveling above, below, and through us. Have a comment, question, or suggestion for the team behind All Things Neutrino? Email us.